One of my favorite farm books is Fertility Pastures by F. Newman Turner. Written in the 1950s, it follows on from Fertility Farming to dive much deeper into the grass side of the farm. He focused on animal health through healthy pastures. 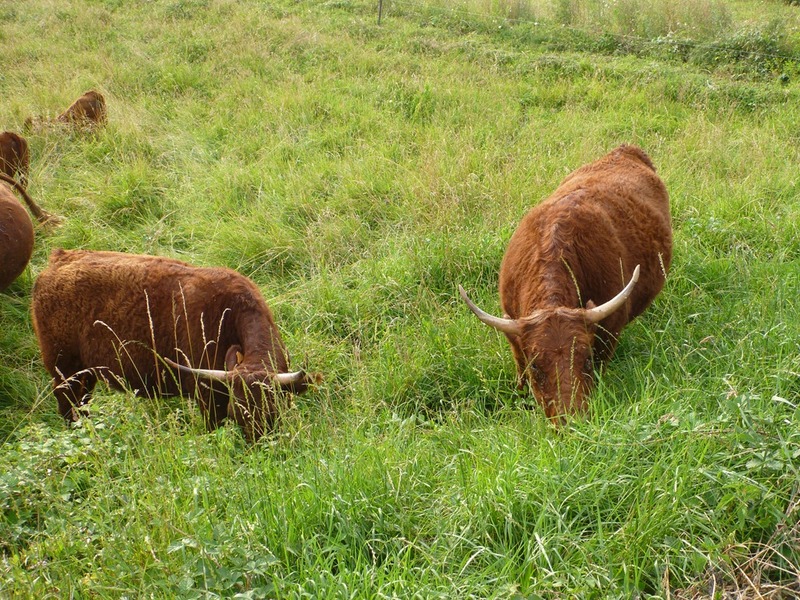 The cows were allowed to walk alongside the plots and help themselves under the fence, in the manner which cows love, of trying the grass through the fence. We all know the habit which cows have of preferring the grass in the next field or paddock if they can get to it—and how, even with strip grazing with an electric fence, they always graze harder just under the fence into the next plot than the plot they are on. This fondness for the next paddock was extended to a choice of thirty-five next paddocks; for they were allowed to sample freely of the edge of each of the thirty-five plots daily for two weeks. He ran a ‘grass is greener’ test where the cows ate the plots in the next strip! Newman Turner was either very smart or had a fine sense of humor. Maybe I’m kidding myself but a large number of the species he tested occur naturally here at la ferme du grasspunk. Lucerne (alfalfa), ryegrass, cocksfoot (orchard grass), timothy, meadow fescue, red and white clovers, plantains, and so on. But the big star of Newman Turner’s show is chicory and chicory isn’t on the farm. The greatest bulk was produced by thickly sown Chicory; for cut or graze as I would, no matter how frequently, it was impossible to leave the Chicory for more than a few days without fresh growth. It produced many more cuts or grazings than any other ingredient of the ley mixture. I hunted around locally for some chicory seed and it is hard to find here, but I did find a place in the next département that sells it although not normally to cow farmers. They were shocked at the small quantities I wanted to buy. They sell the seed seasonally since it isn’t supposed to last all that long, so I’ll call them back in October when they’ll see if they can sweep out the bottom of the seed bins to find such a small quantity for me. Then as June warmed up all these woody stems grew out of my pastures. I’d seen these last year, but we have about ten times as much this year. One of the things with these long pasture rests is that the forbs get a fair while to grow tall and this time of year this woody-stemmed flower seems to go nuts. It is growing by the wood shed, it is all over the Florida and Emerson pastures and alongside the farm’s road. It flowered with these lovely periwinkle blue flowers, so I went hunting the internet to see what it was that made these flowers. Wild chicory. It has leaves like dandelion so that’s what I thought it was. It has been there all year but without the woody stems. There are parts of the Florida paddock where it looks like a herbal ley rather than a grass pasture – plantain, clover, “dandelion”, birdsfoot trefoil – but now the warm weather has hit it is clear that the dandelion I saw was really wild chicory. The cows have been eating it all year, although they don’t eat much of those woody flower stems. There are plenty of stems with the top missing, so the cows must have eaten them off when they were shorter and softer. Go cows! This is a good post, thanks for sharing this. South-West France reminds me of Iowa where my farm is. Iowa has rolling hills like what I can see from the pictures of your land. I have looked a long time for a blog like this that deals with pasture farming that concentrates on cattle instead of goats and sheep, it seems like most people who blog about farming have goats or sheep and have a big garden and thats about it. I also love the idea of a vineyard. Do you nake your own wine as well or do you just sell your grapes? Looking forward to future post. 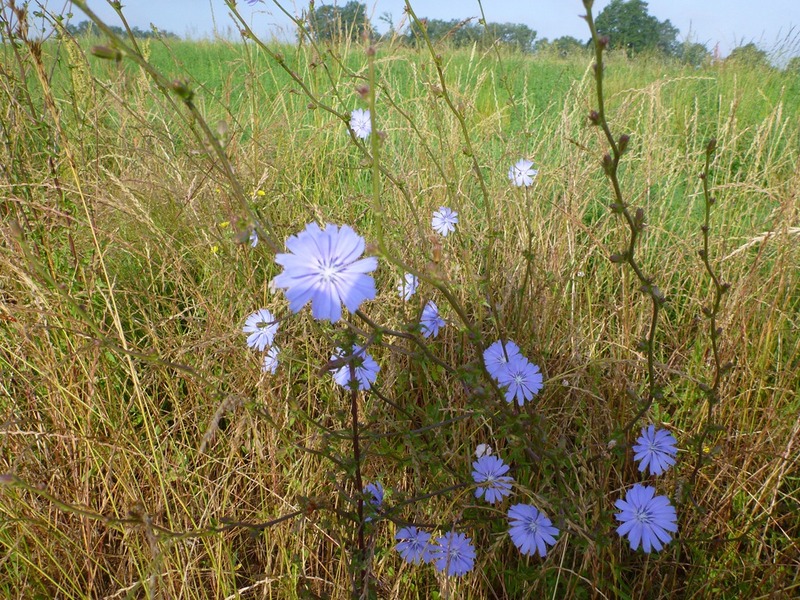 If you were to seed chicory in your pastures, how would you do it? Wild chicory is naturalize here in the U.S. along roadways. I’m trying to encourage to come on into our pastures. Gordon, I just read through your blog. We’re so boring in comparison! I am not sure where your farm is, but most states seem to have something on establishing chicory for forage. If it was my existing pastures I’d pick which season to sow (need to do research whether spring or fall would work better here, but I think it is fall in our climate), then after the herd has left the paddock I’d scrape it with harrows or a disc then broadcast seed on top. Maybe roll after with the cultipacker. But I’ve never yet done this and I am no expert. Maybe try a small section one year and see if it works before going all out?